Thank you for your patience with no blog postings during the 2 months of my annual visit to the U.S.
Marian Leishman, a longtime friend from Bozeman, traveled with me to Independencia. 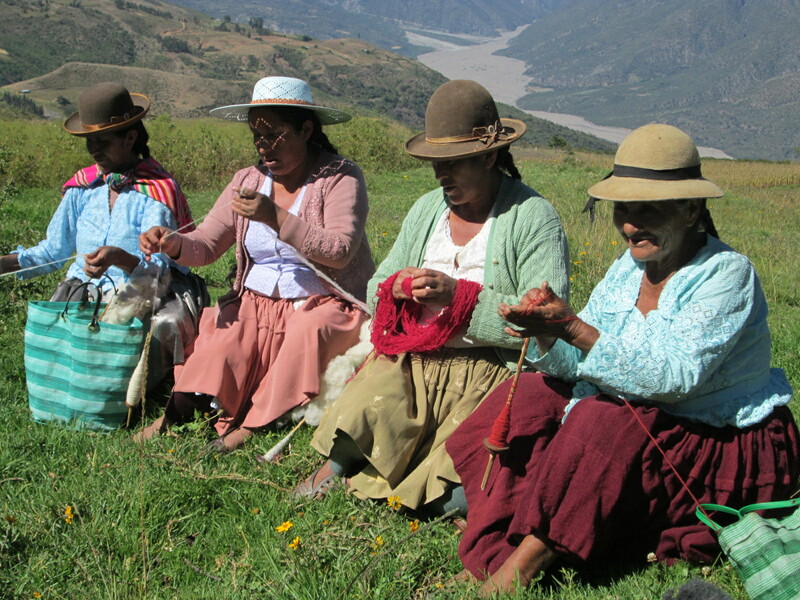 She knits, crochets, quilts, sews, and can fix anything – she is the ideal technical resource for the Club de Artesanas. Along with her skills she schlepped a large suitcase of project materials to share during her 2 week stay. 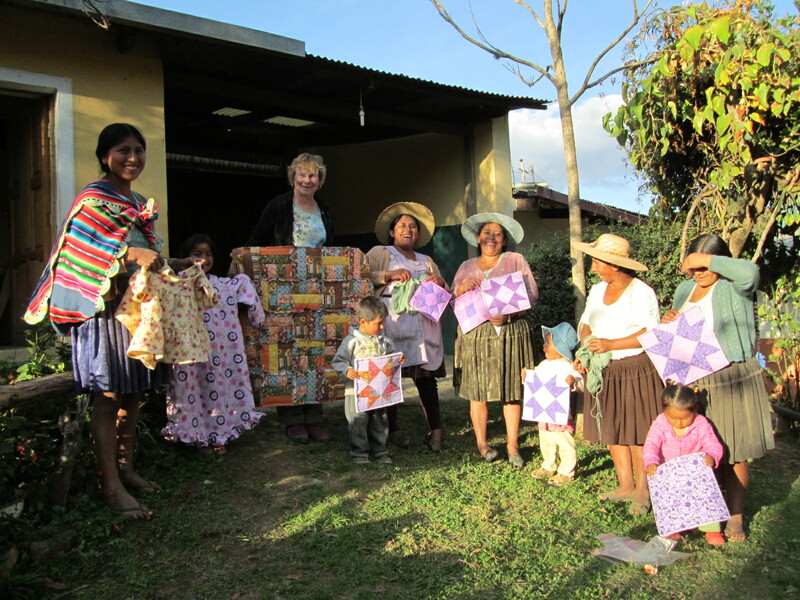 Marian´s workshops began with a private class with Doña Máxima to teach her the first project, quilted hot pads. 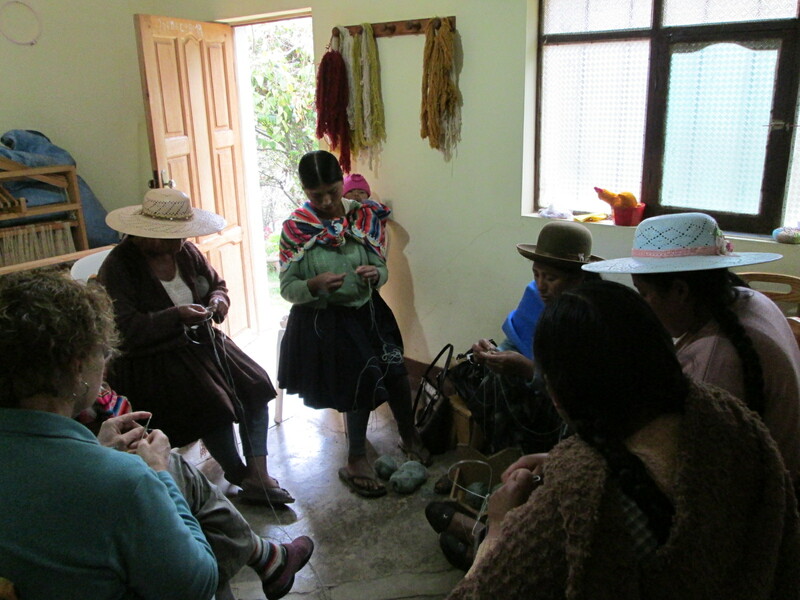 Although Marian doesn´t speak Spanish, the techniques were taught by doing, and Doña Máxima explained them the following day in Quechua. Marian had brought quilting squares, heat resistant batting, Teflon cloth, a self-healing mat and rotary cutter to teach patchwork piecing and quilting techniques. She emphasized the need for precision in cutting and sewing, which are areas in which all Club participants need to improve. The Club had met 6 times during my absence, but the momentum had waned. They were thrilled to jump in with new projects, so we added an extra half day to the first week. The second project was learning to knit toe-up two at a time socks on round needles. The women are high level knitters, but none had ever knit adult size socks. They used locally purchased acrylic yarn and knitting needles. The afternoon had been reserved for the teenage members of the Club, but only Lizeth showed up. 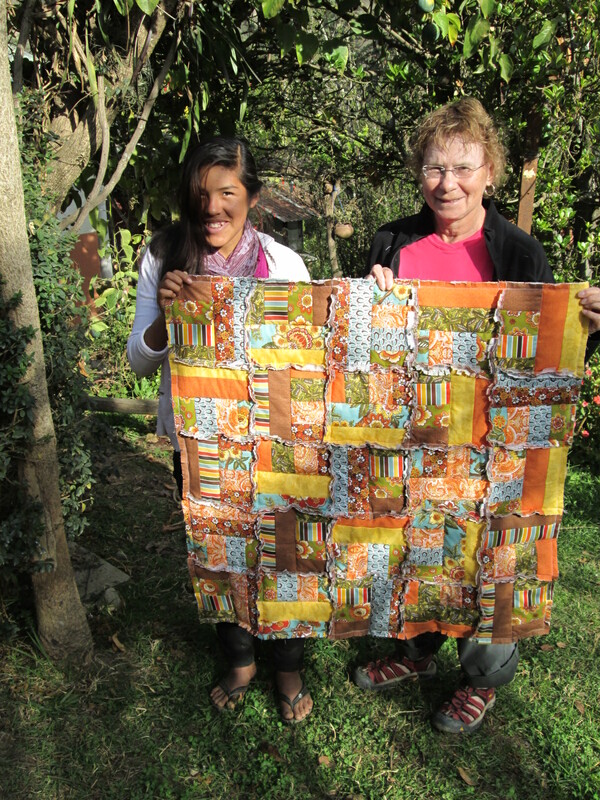 She and Marian worked together to make a patchwork pieced pot holder. As she headed out the door, she said she´d be back on Saturday with more of the chicas. The third project for the women was to sew nightgowns for their young daughters or granddaughters. We´d brought lovely thick, warm, soft flannel from the U.S. Marian worked with the women one at a time to cut out the material. She chose the most adept with the sewing machine to sew the first nightgown, with the understanding she’d have to help the others following Marian’s departure. It is winter and although sunny and 70s during the day, the temperature plummets at night. The adobe rooms with cement floors hold the chill. 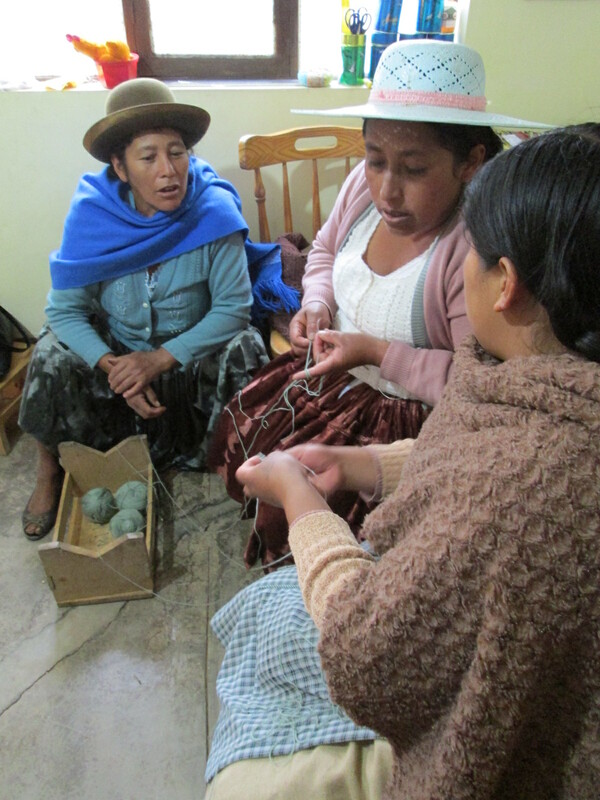 The knitters and their kids would migrate outside, while Marian and 1 woman layered up to sew inside. Our oldest sewing machine has had steady use for 4 years and ceased to function. It will be hauled into town and either repaired or replaced. 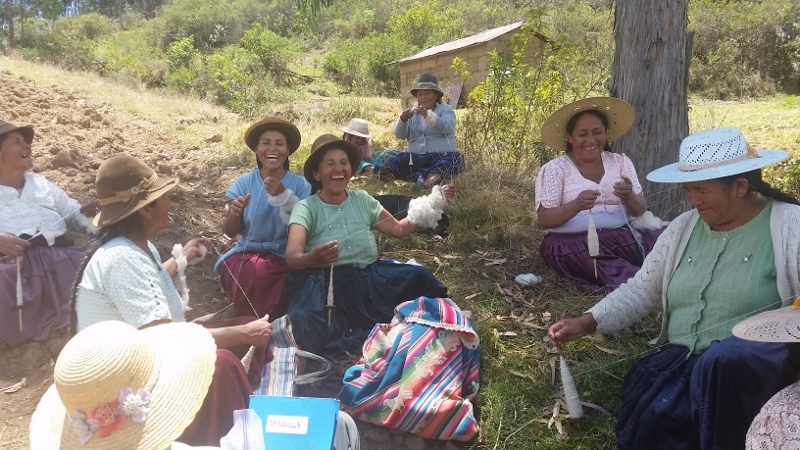 With just one functioning sewing machine, the knitting project kept all hands busy. Lizeth returned on Saturday with 4 chicas and Marian began a new project with them. She´d brought a quilting pattern and a “jelly roll”, strips of quilting material in bright happy shades of yellow, orange, blue, and green. She set the chicas to sewing strips together to make blocks for a baby quilt. 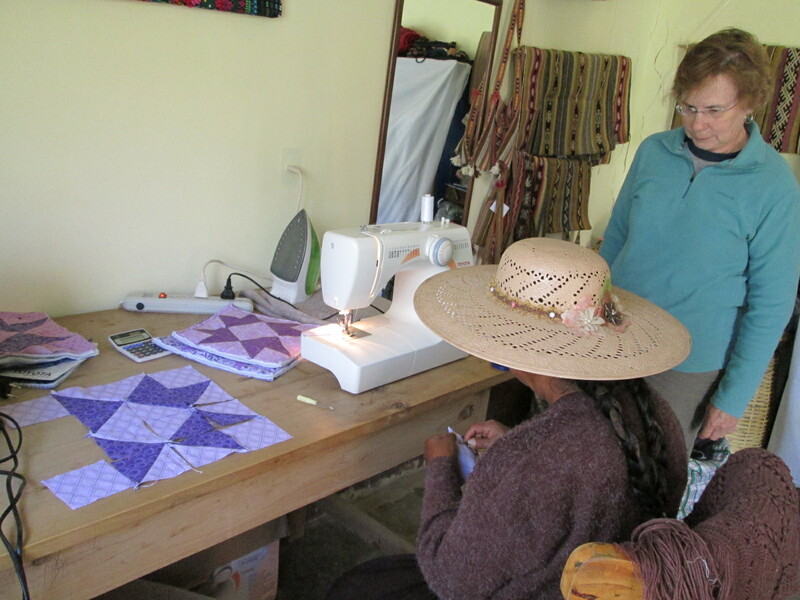 By the end of the session the chicas had all ceded their time at the sewing machine to Lizeth, who returned alone 2 more afternoons to finish the quilt. Although I said it was a group project and it would be put on the wall, it will be displayed for a month and then it will be given to Lizeth. I hope her sewing teacher at the high school will allow her to enter it into the end of the year exhibition. Quilting is an unknown technique here. It was a surprise to realize how proud I was to talk about the quilting heritage of my country. I´m not a quilter but quilts have had an important cultural role throughout my life. Thank you Marian, for this epiphany and for all the technical assistance you provided during your “vacation”.